Vietnam is the host country of the 13th ASEM Customs Directors-General and Commissioners Meeting. To learn more about this event, the Vietnam Business Forum Magazine has an interview with Ms Nguyen Thi Viet Nga, Deputy Director of the International Cooperation Bureau under the General Department of Vietnam Customs. Le Hien reports. Could you please tell us the main contents of this ASEM Meeting? Fulfilling membership obligations to the Asia - Europe Meeting (ASEM), the General Department of Vietnam Customs will chair the 13th ASEM Customs Directors-General and Commissioners Meeting, scheduled to take place in October 2019. The ASEM, also known as the Asia - Europe Summit, is an inter-regional forum officially established in 1996 under a political initiative aimed to create a new partnership between Asia and Europe to enhance exchanges and understanding between the two continents. The highlight of ASEM is informal dialogues that underline equal partnership based on mutual respect and mutual benefit. ASEM opens up opportunity for policymakers and officials to discuss political, economic and social issues of common interests, and support for works done at multilateral forums such as the United Nations (UN) and the World Trade Organisation (WTO). ASEM provides dialogues on three pillars of politics, security and economy, and culture and society. ASEM customs cooperation is part of the economy and security dialogue, with the main priority of complementing and strengthening the implementation of the WTO multilateral trading system. The working mechanism in the ASEM customs forum includes the Annual Meeting of Customs Working Group and the biennial ASEM Customs Directors-General and Commissioners Meeting. What is the priority of this ASEM Customs Directors-General and Commissioners Meeting? The ASEM Customs Directors-General and Commissioners Meeting serves as a forum for guiding and directing working groups to carry out action plans approved by ASEM Customs Directors-General. In 2018 - 2019, the ASEM customs action plan focuses on cooperation measures and directions in the following priority areas: Trade facilitation and customs procedures, facilitation of paperless customs procedures; customs management over cross-border e-commerce; connection and transit; single-window mechanism for rapid customs clearance, automated and integrated risk management; fight against counterfeiting and enforcement of intellectual property rights; enforcement of border management of international parcels; and vision on ASEM prospects. Carrying out contents of this action plan is mainly based on sharing information, experience and recommendations with the support of the coordinating members. As the host of the ASEM Customs Directors-General and Commissioners Meeting, what are the opportunities for Vietnam? Continuing the ASEM Customs Action Plan 2018-2019, as the host country, the General Department of Vietnam Customs plans to recommend some priorities for inclusion in the ASEM Customs Action Plan 2019-2020, including: Applying the Industrial Revolution 4.0 to integration and linking of information technology systems for effective customs management; promoting the customs - business partnership; protecting the environment, society and security; and facilitating supply chains. 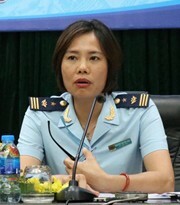 With these priorities, Vietnam Customs expects ASEM members to exchange and put forth recommendations and initiatives to connect and integrate information technology systems to perform its good roles of managing export and import activities, protecting the environment, society and security, and facilitating supply chains. By hosting the ASEM Customs Directors-General and Commissioners Meeting, Vietnam Customs hopes to forge regional customs connectivity and cooperation amidst the strong Industrial Revolution 4.0 while the world is facing many security issues in the fight against terrorism; transport of goods detrimental to the environment and society with an increasingly complicated level, with an increasingly sophisticated manner and in a rising volume; or pressures on sustaining economic growth in response to climate change. In addition to achieving consensus on priority contents in the ASEM Action Plan 2019-2020, Vietnam Customs will step up receptionist and logistics preparations to boost the culture and country of Vietnam among regional and international friends.